Creeping vs. crawling…what’s the difference? A few days ago Noah started getting into quadruped on his own. It wasn’t a milestone post, but it was a huge one in our book. Check him out…he’s on all fours! I love this little inchworm! Noah has been mobile for quite a while. 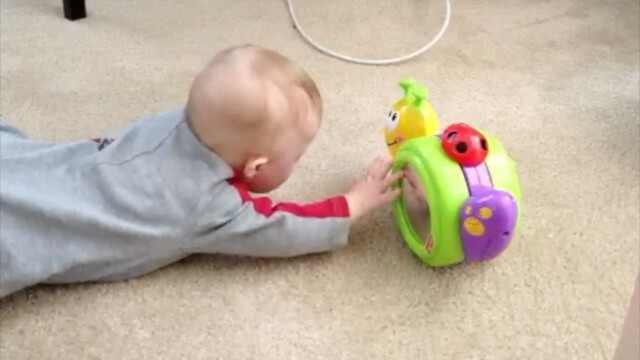 (He even turned his crib into a learning-to-crawl exercise machine.) He gets places by scooting on his back, or his preferred way which is rolling until he hits something. I have found him under couches, across the room, and of course finding the most dangerous things in the room like outlets. Today he found a way to keep his eye on the prize and move forward. We call it the inchworm. He gets into quadruped, falls forward and is up again. Per Patricia Winders this would be a type of crawling. I am surprised how fast he can do this, it is actually a pretty good way of moving. It also blows my mind how one day Noah is just able to do something. We had no idea this milestone was coming. The video is moments after he did this for the first time, and as you can see, he isn’t just taking one inchworm, he is going across the whole floor. In my opinion it is pretty impressive. This kid is going places! Literally. Patricia Winders book, Gross Motors Skills in Children with Down Syndrome: A Guide for Parents and Professionals , is an invaluable resource to any parent raising a child born with Down syndrome. It’s one of our top resources, and one that I find myself going back to again, and again. In the book she states that there are 4 types of early crawling methods which parents need to recognize. Once your child determines their method she wants you to encourage that method as much as possible. 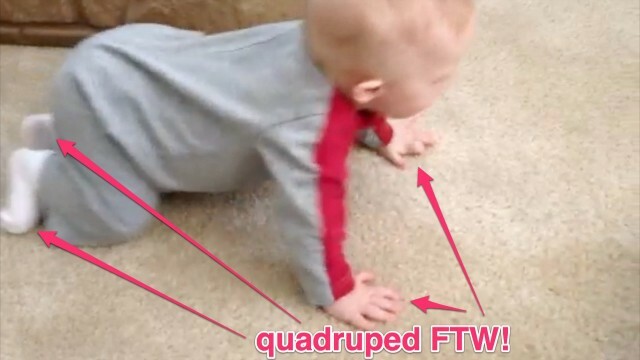 The four crawling methods are below, see if any of them describe a method your child seems to be drawn to. Can you see the pride dripping off his cute little face? Did your child do any of the alternative crawling methods mentioned in the list above? Take a second to leave a comment below and tell us about it. My son may not have DS, but he is a preemie with heart issues and developmental delay. I learned more from your post about his crawling/creeping than I had learned from many others (which may be because our first physio appointment is this afternoon). Thanks so much for all you share with us!!! Our son, Michael (19 months), started with the “Army Crawl” (still his preferred Method), but he also does a mean “Bear Crawl”, and a “Tush Scoot”… in the last 2 weeks, he has shown more and more interest in walking, and used a walker in therapy last Friday. The amount concentration and determination was evident on his face. It awesome to see our little one work so hard (and inspire our older ones to work harder). Thanks for your Blog! I just love, love, love the look of pride on little Noah’s face. You are superb parents, celebrating his new accomplishment in such a way that makes his little face light up with pride. Keep up the good work. Noah is so lucky to have you guys for parents, and I know you guys are lucky to have him. Thanks. It’s so much fun seeing his face light up like a Christmas tree when we finally hits a milestone. 🙂 Do you guys have ay children? Oh yah…Noah likes to roll also. I need to go back and post some videos of him rolling (it was before we started this site.) How old are your children now? that was awesome, loved the proud face at the end 🙂 Louis is 8 months nearly and was also born with DS. he is starting to put his knees up to his chest and push, not moving his arms yet but trying to push none the less. Its really good following your posts as it is encouraging and give us things to look out for. Thanks, it’s good getting to know your story also. Feel free to post a picture below (and on our Facebook page)…we enjoy meeting families! Where are you guys from by the way? We live in the UK,we started OT yesterday and it was a bit of an eye opener how hard they worked my little man. It was good though knowing he will get really good support. Our son is still doing the backwards slide and the speed roll (17 months with DS ) he also has a standing frame to build his leg strength 🙂 reassuring to know that kids the world over find outlets fun! You better believe they do. It’s like they have some sort of magical power that lets them know right were dangerous things are. Ha,ha! omg another one that i just cant like cuss i loveeeeeeeeeeeeee it lil inch worm noah way to go lil man u will be walking soon n driving daddy n mommy crazy running to get you on video way to go lil man. that deserves more choc pudding. Awesome! Love sharing milestones and helping others celebrate theirs. It’s a joyous occasion and like you said, our kids all reach their milestones at different times and in different order – just like all other kids. Way to go Noah on all your milestones! Indeed they do! How old are your children? Congrats Noah! How exciting for everyone. How old is Noah? My Gran-Son is 4 with DS and he was a Commando crawler at first how quickly he went to all four crawling which he remained with transit till 6 months ago how proud and smart he shows everyone everyday…. I do enjoy sharing Noah’s adventures in his daily life he warms my heart God Bless…..
My son Jacob was doing that and rolling to get around, but now he is crawling and very good at it he never sits still he just wants to explore the house. We have to start teaching him how to slide down the steps. He is SOOO close to popping up on all fours too!!! What a man. This is a huge milestone! YAYYYYYY. This next year is going to be sooo fun for you guys. Oh my goodness. 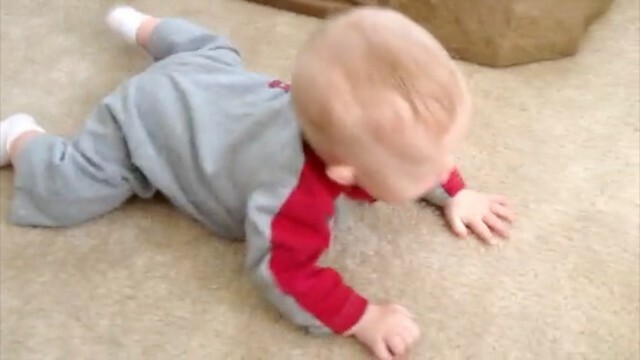 That video is adorable of Noah scooting across the floor. He is precious. Here is a picture of Jake before church last Sunday wearing his fancy duds that his “Aunt Mimi” mailed to him. Oh yea. I forgot to mention that Jake is rolling from back to front and reaching for toys. He is 7 weeks so I think he is doing well so far. He was diagnosed with trisomy, but mosaicism is suspected. DS wasn’t suspected when he was delivered. They decided to do a chromosomal analysis because he was having feeding issues. We were completely shocked and so new to this, but I so love hearing about Noah. It is so encouraging to see you celebrate his life and cuteness every single day. Love, love, love the pics of your Noah & your blog. My son Elijah is 4 years old and still needing to strengthen his core. Elijah never really crawled…he commando crawled and transitioned into scooching on his behind for a long time. He used a walker for bit and then walked at age 3. He still needs help climbing stairs but has taken flight with his running as of late and getting better at jumping! And rolled for what seemed like forever before he started crawling. Wow Abbie! That is really something else. I think that is possibly the cutest video of Noah yet! I was so happy, grinning ear to ear and cheering him on as well! What a cutie patootie! It’s good to see what we have in store for us. I guess now that things are starting to settle down, I should pull out my DS books and catch up with you guys – or just keep reading your blogs! They are both great resources! I can’t wait to show this to Scott. Hi thanks for this blog its very helpful information. 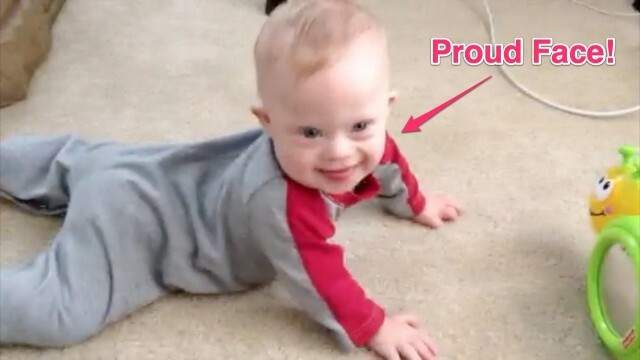 Well my son is 20 months with down syndrome now he is not crawling on his knees but is frog walking I am really confused that is it a right way to crawl. I have tried but he is just not able to crawl on his knees. Can you help me.